Health Magazine launches new a blog to create a one-stop shop for all health, wellness, and fashion engagement. Health Magazine is pleased to announce the launch of our brand new blog! As a platform that allows fast-growing companies to connect with today’s socially charged and health-minded consumers, the blog will create compelling content in popular niches such as health, wellness, food, fashion, lifestyle, family and leisure. Keeping in mind the increasing need for brands to build a digital identity with rich, relevant and engaging content, the Health Magazine led blog will develop creative content that helps brands speak to consumers authentically. The blog specializes in providing the resources and content that make consumers’ lives easier. Exploring seamless ways to integrate a product message into the busy lifestyles — whether it’s tackling the beauty challenges that accompany allergies or picking the best lotions for all your winter blues hair — the Health Blog will help strengthen brand loyalty, and keep the products top of mind in the moment’s consumers need them most. Health Magazine would, therefore, like to invite organizations, businesses, and professionals to contribute with their product news, services and more, to help us bring value to the UAE community, gain credibility and trust of customers and develop a lasting relationship. 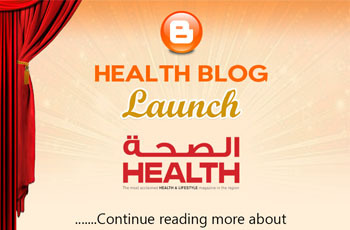 HEALTH was launched in 1999 by Gulf Medical University, Ajman – UAE, as a health & lifestyle magazine for the family. Published bi-monthly, this BPA-audited bilingual magazine appeals to discerning readers from the wellness industry as well as healthcare professionals, beauty, lifestyle, and fashion enthusiasts in addition to families regionally and globally looking for wholesome, current and extremely informative articles and features. Every section, every feature, and every story in HEALTH Magazine is conceived, written and designed with our reader in mind. Our editorial content is a well-balanced mix of cutting-edge topics alongside informative and entertaining features designed with the reader in mind, while simultaneously optimizing advertiser exposure. HEALTH has risen to the forefront of health and lifestyle magazines in the region, carving a niche of its own, as a dynamic, popular, youthful and savvy magazine.